America's biggest companies are united for "urgent" action on the debt and united against the the fiscal cliff, which would cut the deficit immediately. Huh? America's most powerful CEOs are in absolute agreement: The debt stinks. And we need to fix it. Policy makers should acknowledge that our growing debt is a serious threat to the economic well-being and security of the United States. It is urgent and essential that we put in place a plan to fix America's debt. The tone of these opening bromides might cause you to think that the U.S. doesn't have a plan to fix the debt. In fact, we do. It's a three-step plan. Step One: Do nothing. Step Two: Repeat. Step Three: Watch the deficit plummet by hundreds of billions of dollars in 2013. It's called the "fiscal cliff" and here's how it would reduce the deficit, category by category. Automatic cuts scheduled back in the summer of 2011 (a.k.a. : "sequestration") would reduce the deficit by about $80 billion. Failing to renew benefits for the unemployed would cut another $40 billion in spending. And letting tax law run its course would increase government revenues by more than $400 billion, bringing us even closer to a balanced budget. All of this will come to pass if Congress sits on its hands for two months. It's a simple solution to our debt problem. It's also a drastic and potentially disastrous solution. It would lower the typical family's disposable income by $2,000 and drive the U.S. into a short, but steep, recession. That's why none of these CEOs who signed the letter above want to reduce the deficit even though they claim it's "urgent" that we reduce the debt. America's biggest companies are united against the fiscal cliff because -- wait for it -- they want tall deficits. They need tall deficits. Maybe it's not obvious that huge federal deficits today are good for big businesses who rally against the debt. But they are. Our deficits today are the result of two things: Historically low taxes and historically high spending. Historically low taxes on families increase take-home income, bolstering overall spending on stuff that corporations make, which raises corporate income. Special tax exemptions passed in the stimulus and expanded since have saved corporations millions on depreciation and new payroll-tax-free employees. Meanwhile, historically high spending has set a disposable income floor for families without jobs while maintained support for contractors. The case is made even more clearly with graphs (of course). Here's a look at corporate profits and their causes. The big red gash you see at the far right? That's the contribution of government borrowing to corporate profit margins since the recession hit. 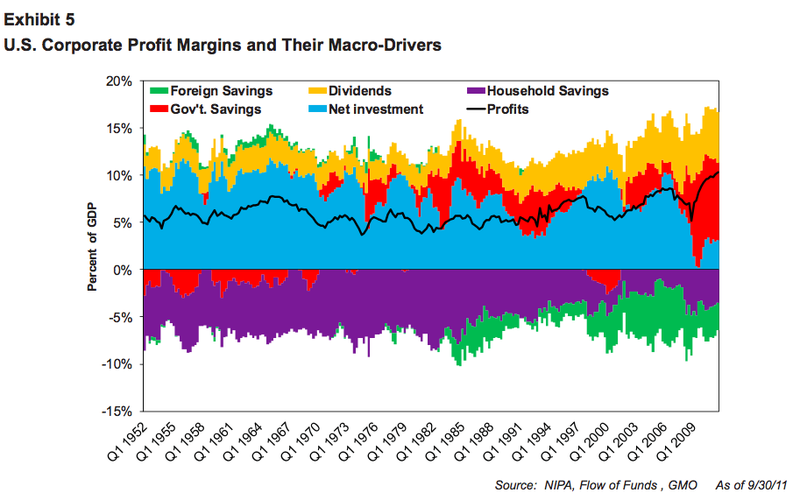 It shows the various drivers and drags on corporate profitability. So for example, household savings are always a drag on profitability, since that's money not spent to buy goods. Net investment helps boost corporate profitability, since that investment will flow to the profit line of another corporation. When the government is in a surplus, that reduces corporate profitability, since that means the government is taking in more than it pays out. When the government is in deficit, that boosts profitability ... As you can see in the chart, what REALLY stands out is the huge explosion of the red area (representing government deficits), helping to drive corporate profits at a time when nothing else is doing the work. And here's another Weisenthal find: The close correlation of corporate profitability to the inverse of government and household savings (with a one-year lag). What you're seeing is an elegant explanation of why short-term deficits are necessary after financial crises. When the private sector starts saving in response to a credit crunch, only the public sector can swoop in with large and offsetting deficits.